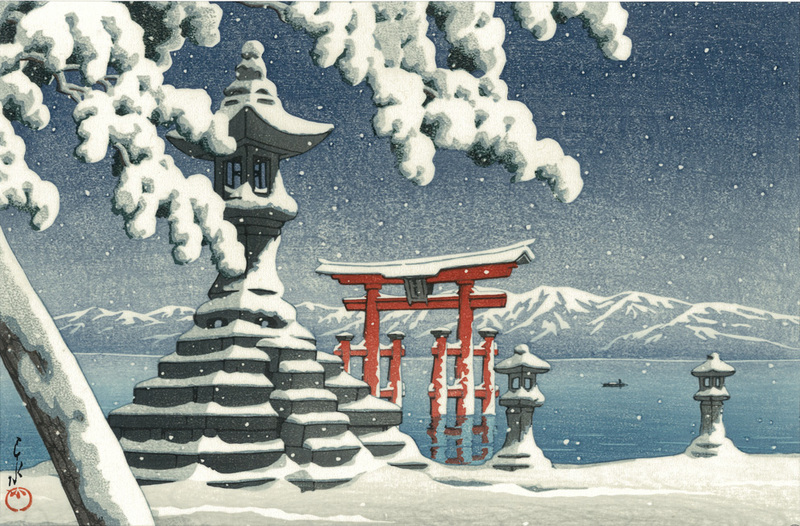 Here is only one site you can buy Hasui directly from Japan !! 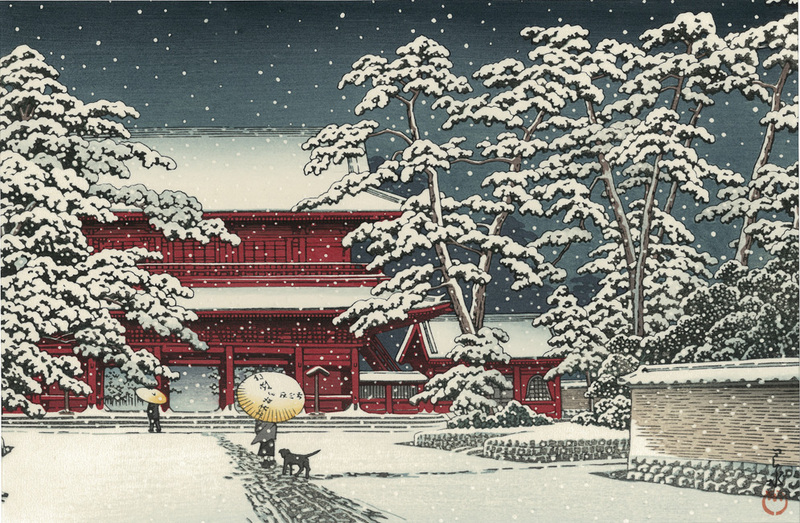 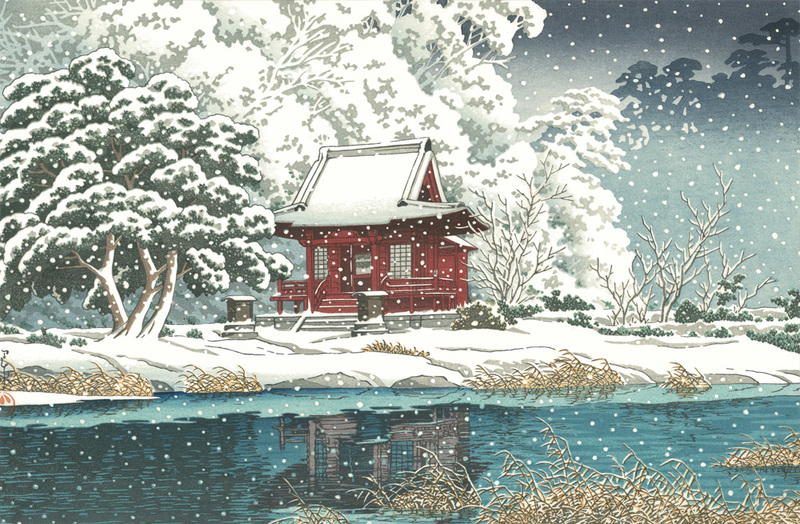 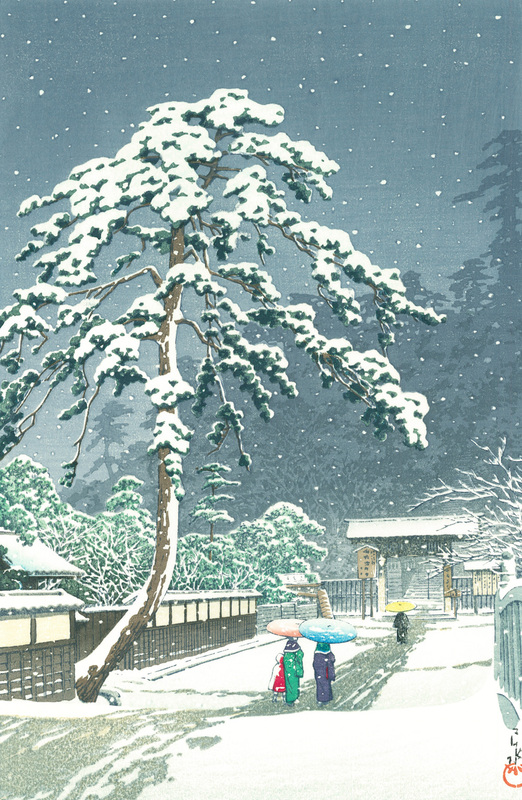 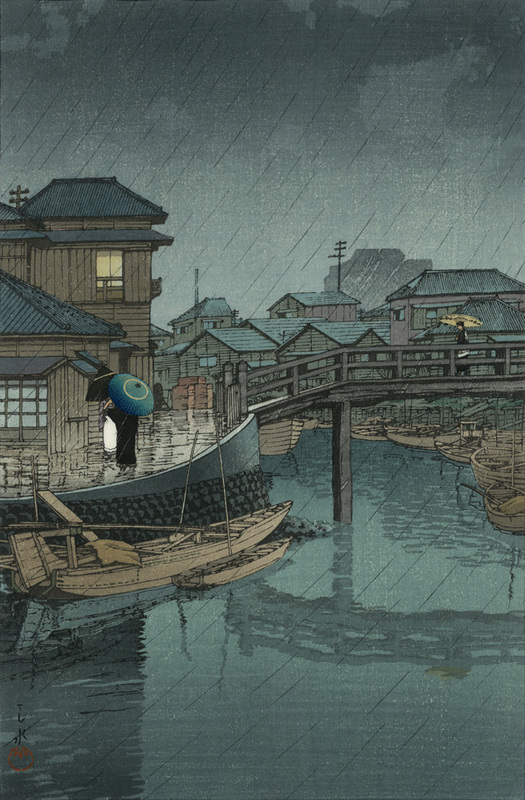 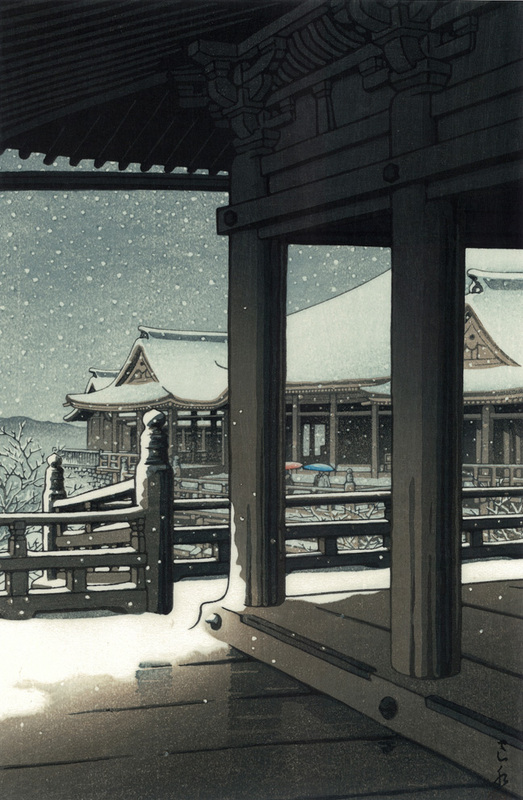 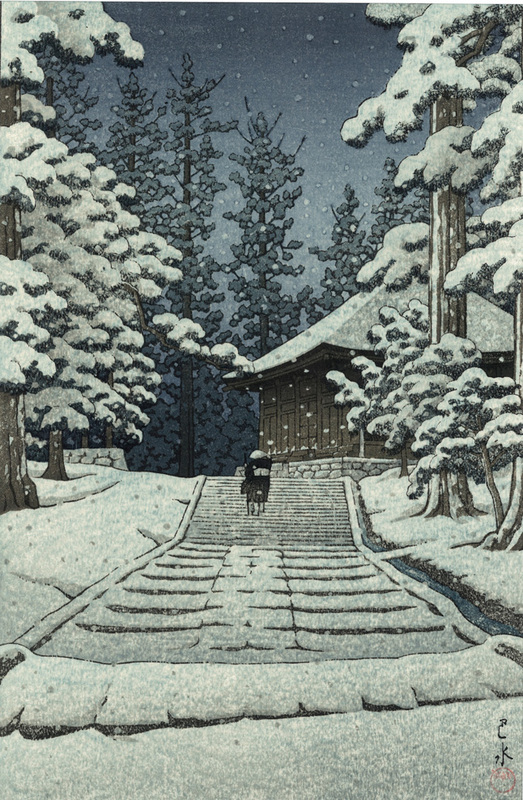 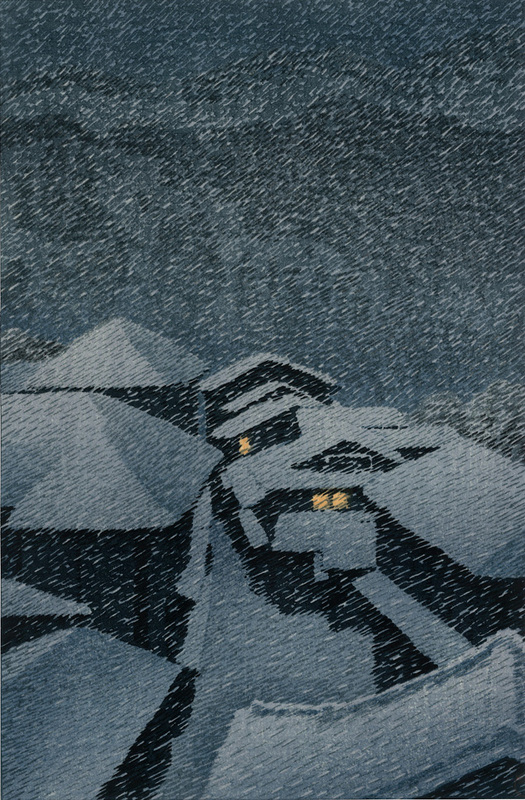 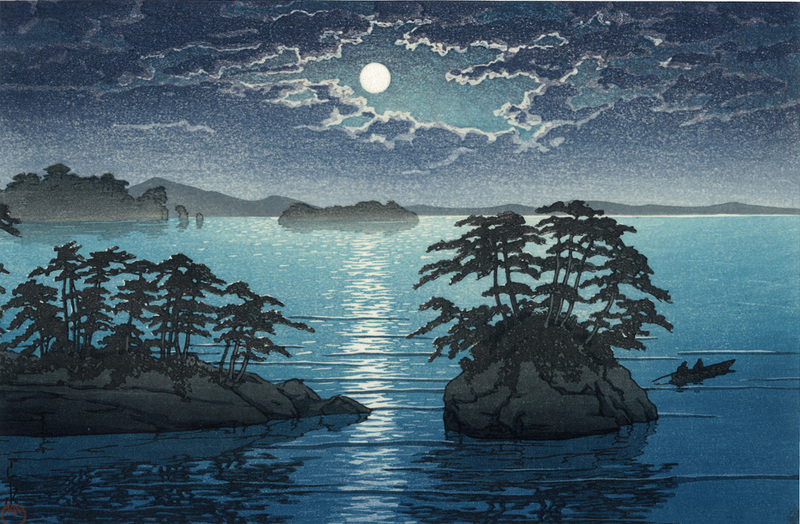 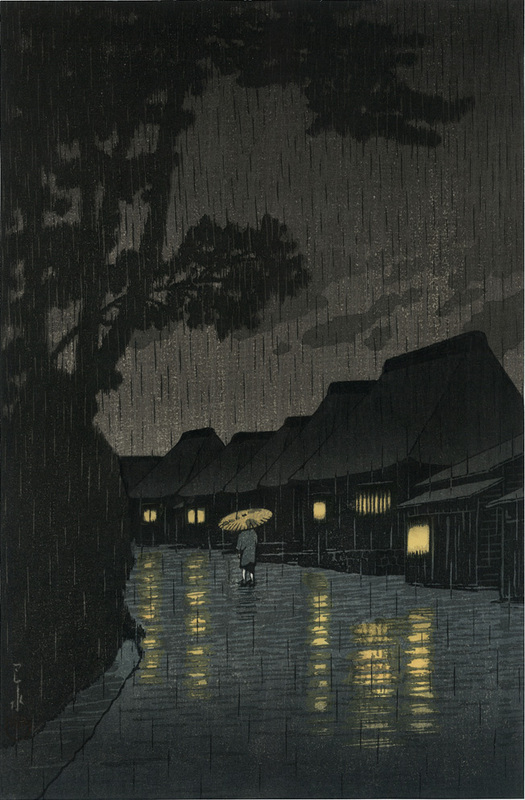 Kawase Hasui, whose name is Kawase Bunjiro, is widely known by his professional name, “Hasui”. 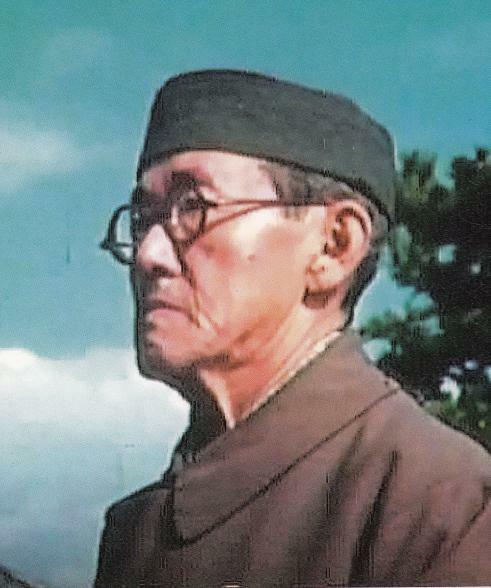 He was born at Shiba, Tokyo, on May 15, 1883. 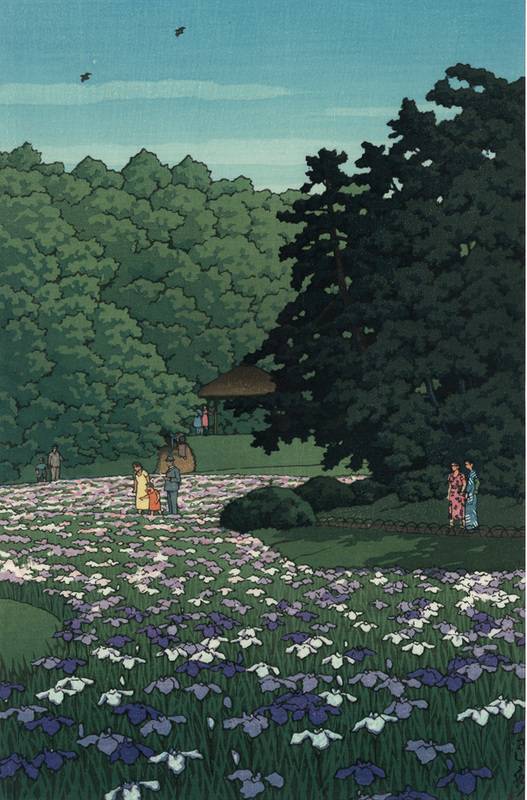 From childhood he loved to paint; later, he became a pupil of Kaburagi Kiyokata, and he exhibited his first picture for the Tatsumi Painting Exhibition in 1912. 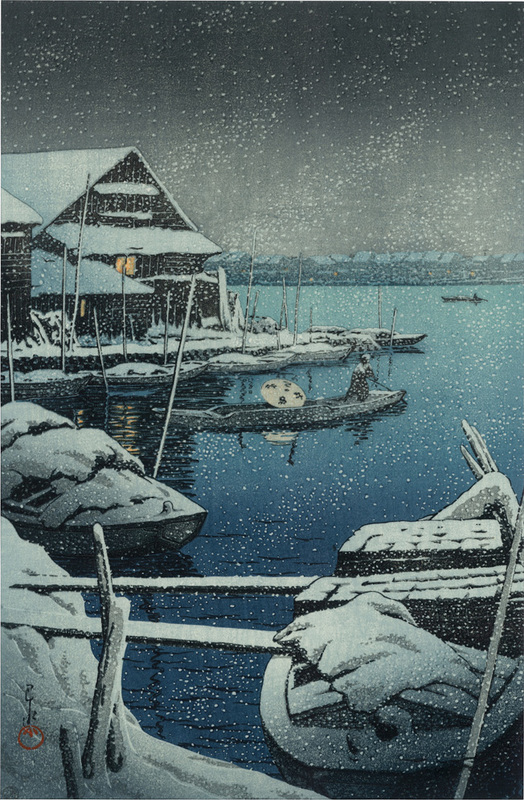 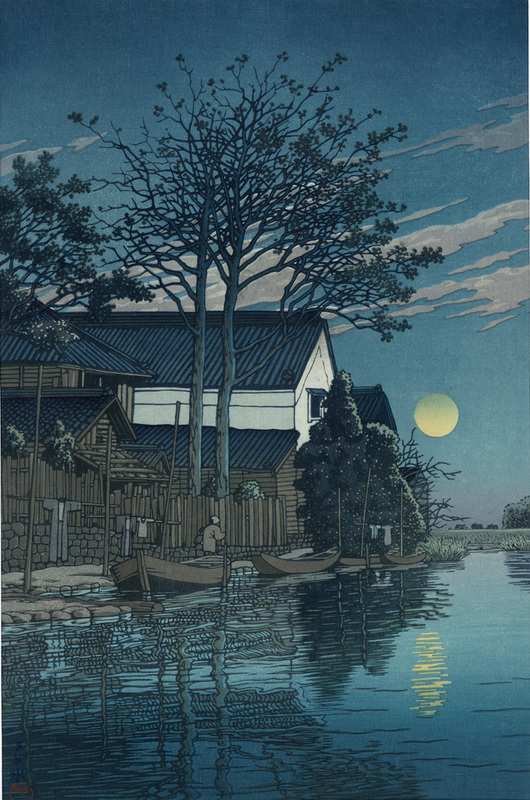 During the early stage of his art career, Hasui produced only paintings: he became interested in wood block prints after seeing Shinsui’s prints, “Eight Views of Lake Biwa”. 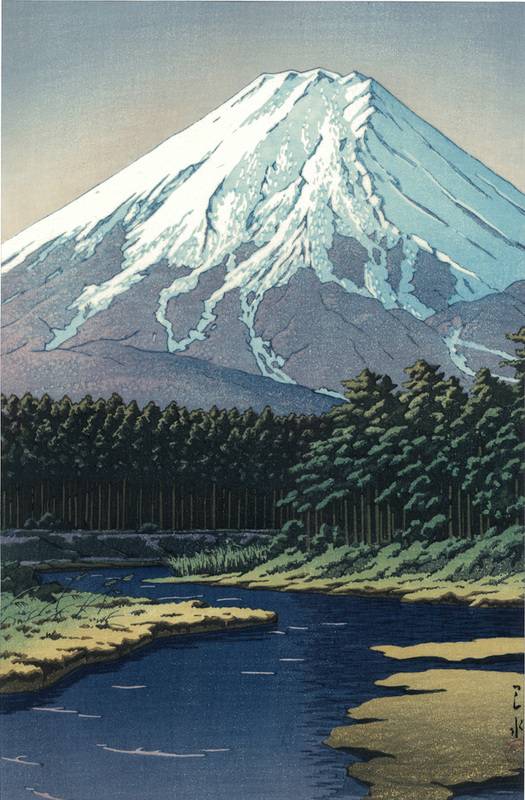 Some of Hasui’s small landscape pictures led S. Watanabe of the Watanabe Print Shop to see his possibilities as a print artist, and Hasui did his first color prints from a series of sketches made at Shiobara in 1918. 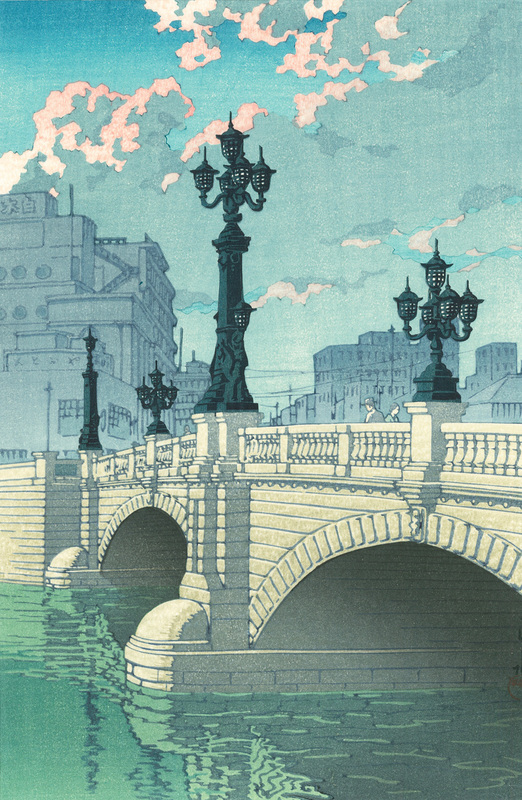 There were followed by several series: “Twelve Views of Tokyo”, the “Souvenirs of Travel, First Series” in 1919, the “Souvenirs of Travel, Second Series” consisting of 28 prints, in 1923, and “The Twelve Month in Tokyo”. 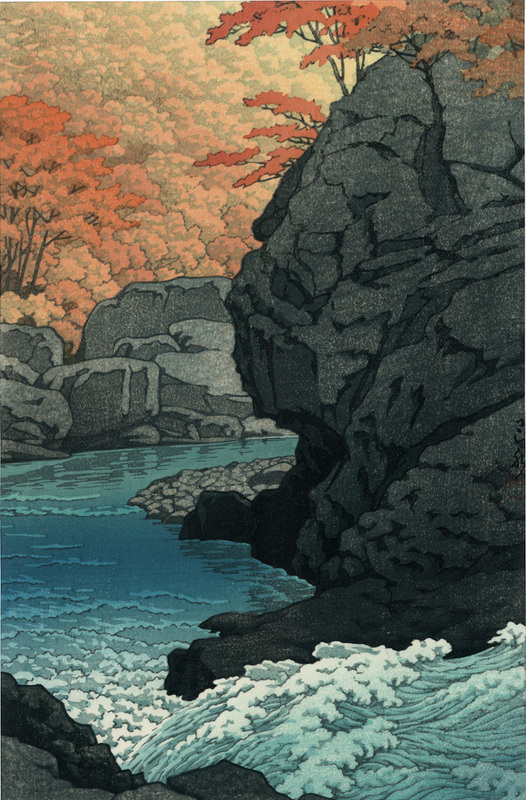 In 1922, he began to produce “A Collection of Scenes in Japan” in 12 installments, but at the time of the publication of the eleventh installment, the great earthquake and fire of September 1, 1923 occurred, destroying the blocks and prints and the artist’s precious sketch-book. 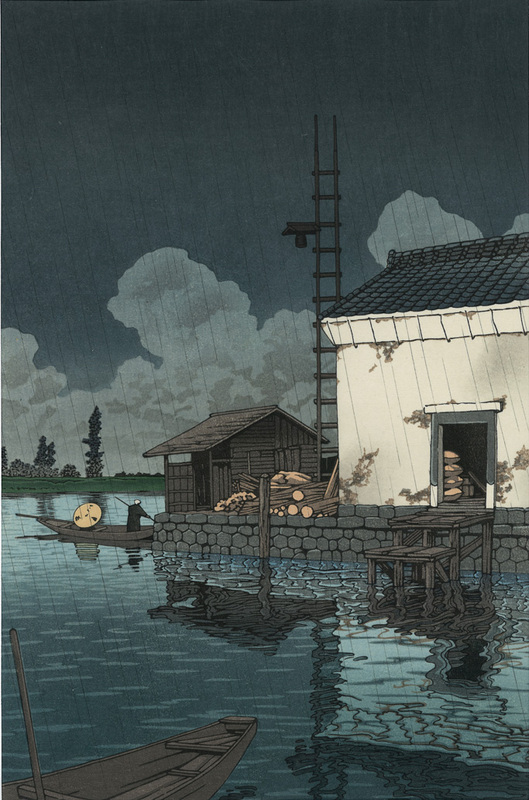 Without losing heart at this disaster, he started on October 23rd a sketching tour through the regions of Hokuriku, San-in, Sanyo and elsewhere, returning to Tokyo on February 2nd of the following year. 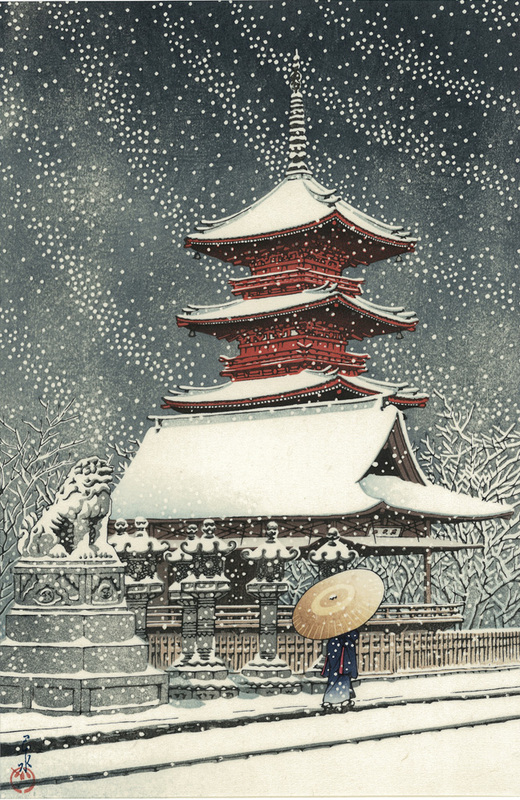 As the result of this tour, “Souvenirs of Travel, Third Series” was the first prints after the earthquake disaster. 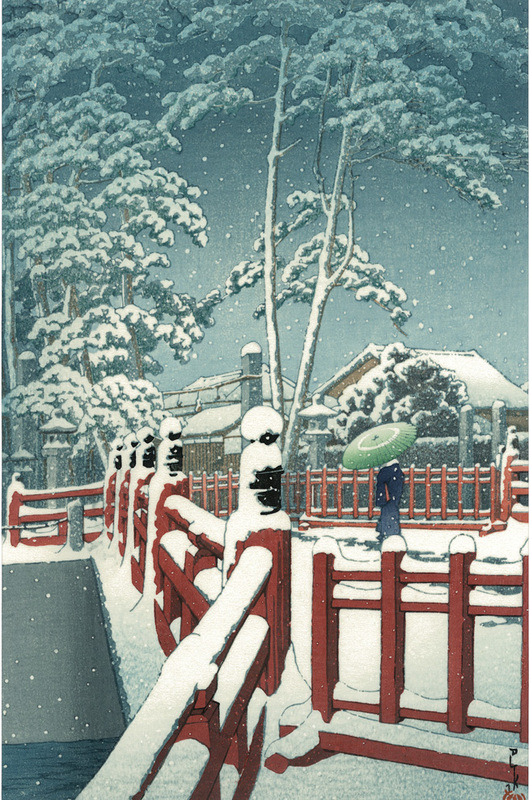 Since then he continued to actively produce prints until his death on November 27, 1957, in Tokyo. 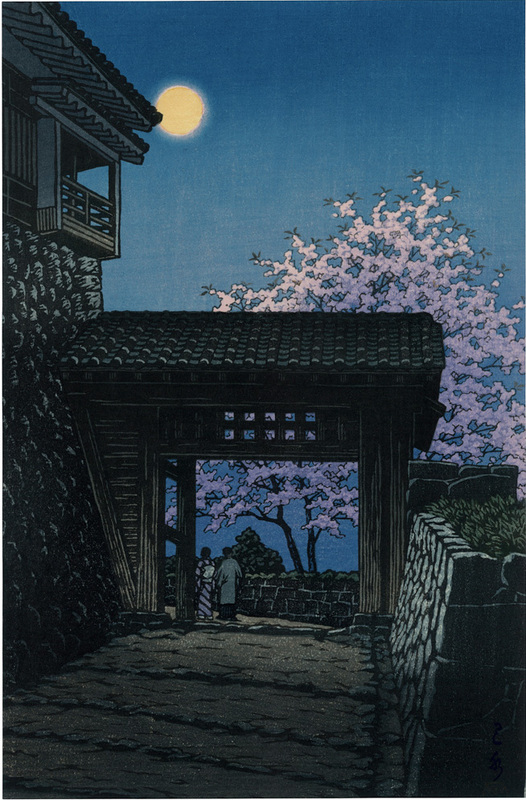 it is famous that Steve Jobs (1955-2011; CEO of Apple Inc.) was also fervent collector for Hasui. 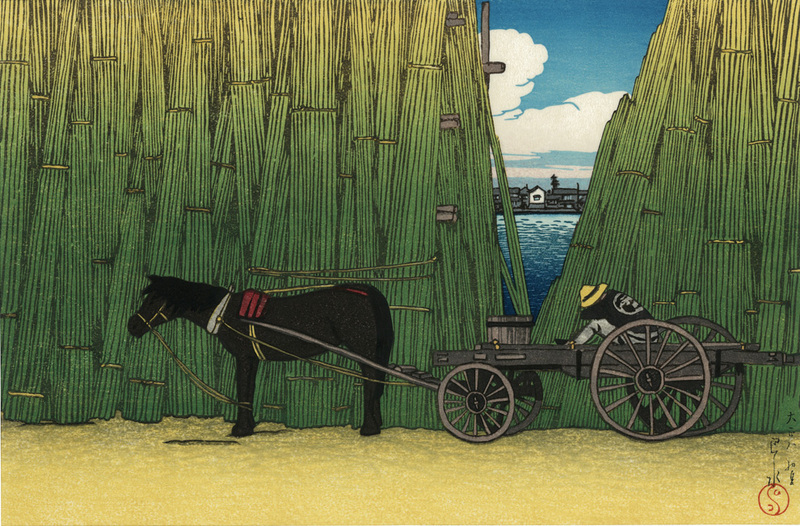 Ushibori is located at the entrance of Kasumigaura lake in Ibaraki prefectural, and here was developed water transportation business in old days. 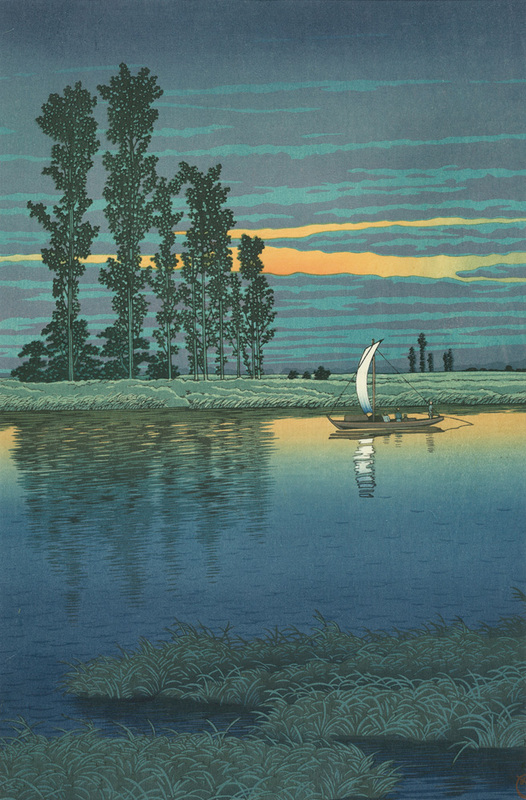 Hasui expressed sunset lighting and shadow on the surface of a river, emotionally and beautifully. 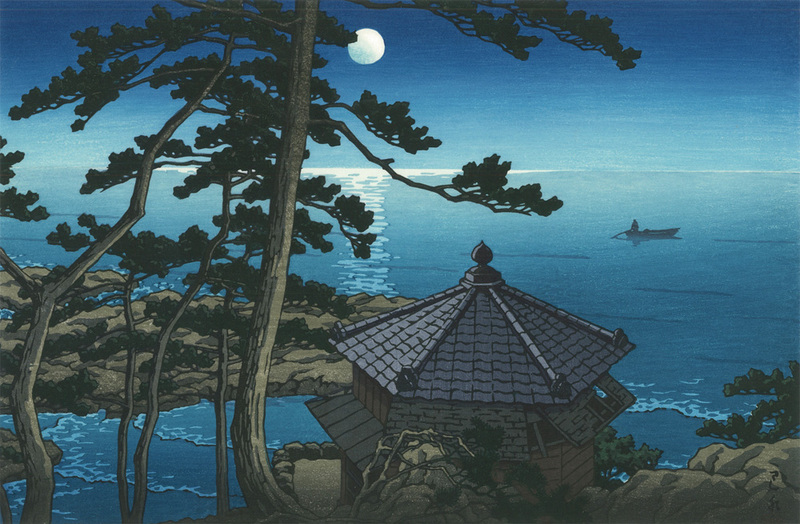 He drew a lot of landscape works in Ibaraki prefectural which were not famous place but expressed emotionally and beautifully. 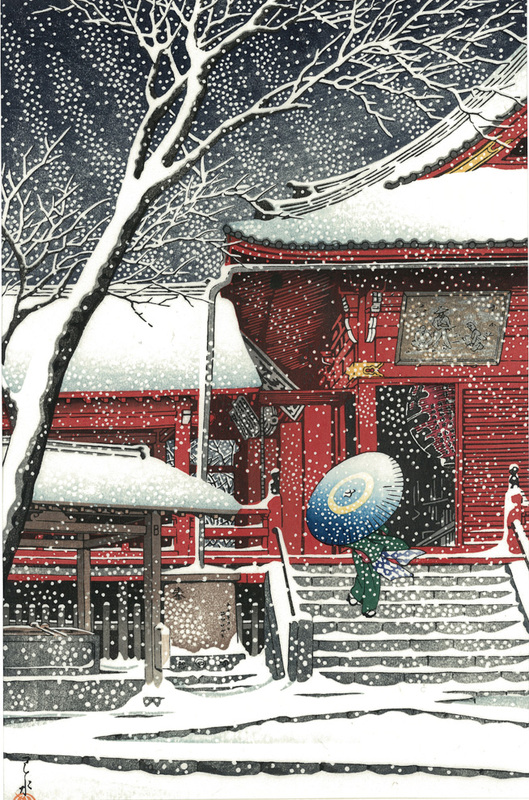 Komagata is one of place name in Asakusa, Tokyo. 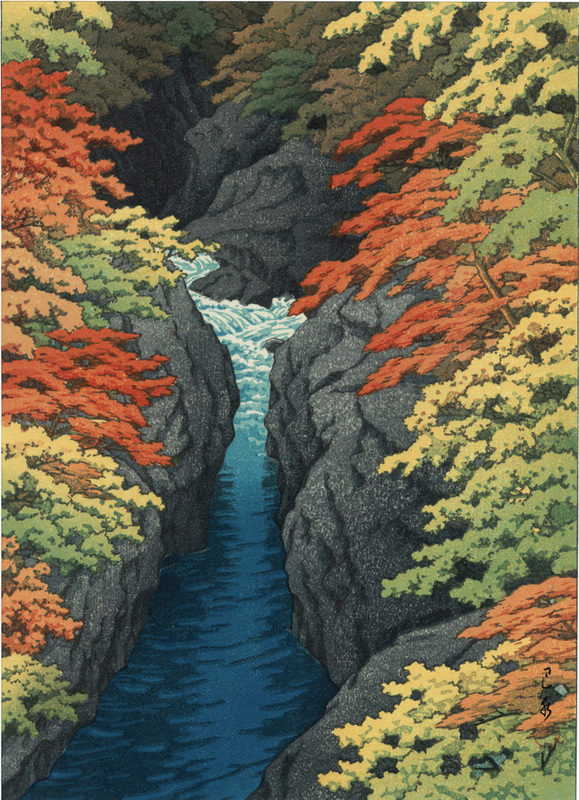 There is a river Ookawa (present name is Sumida river) in Komagata. 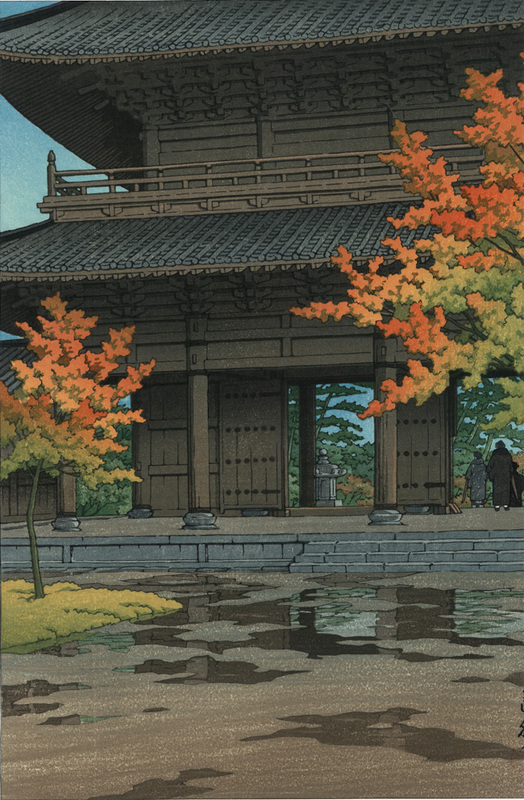 Hasui drew a sketch of bamboo shop at a bank of Ookawa in a summer day. 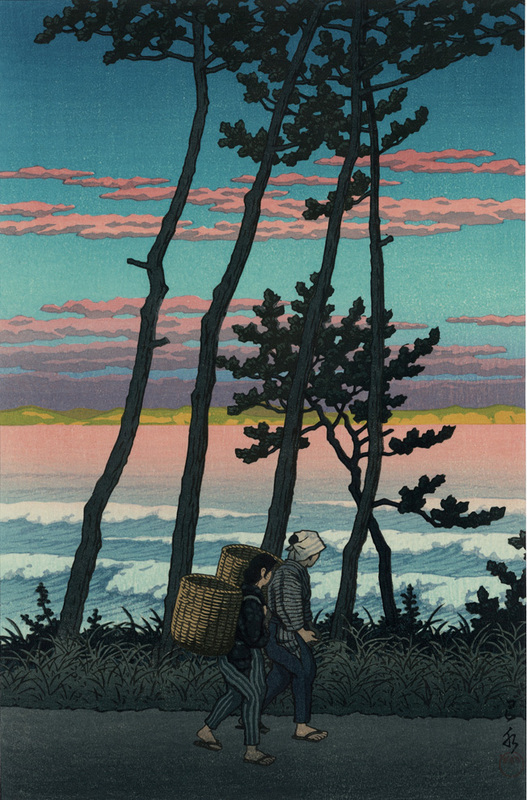 The opposite bank can be seen from the interval of the displayed bamboos. 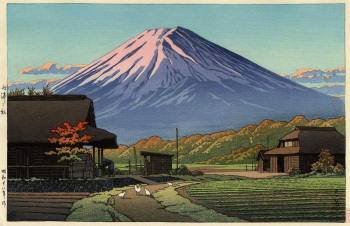 This is the work which have a feeling like the summer afternoon. 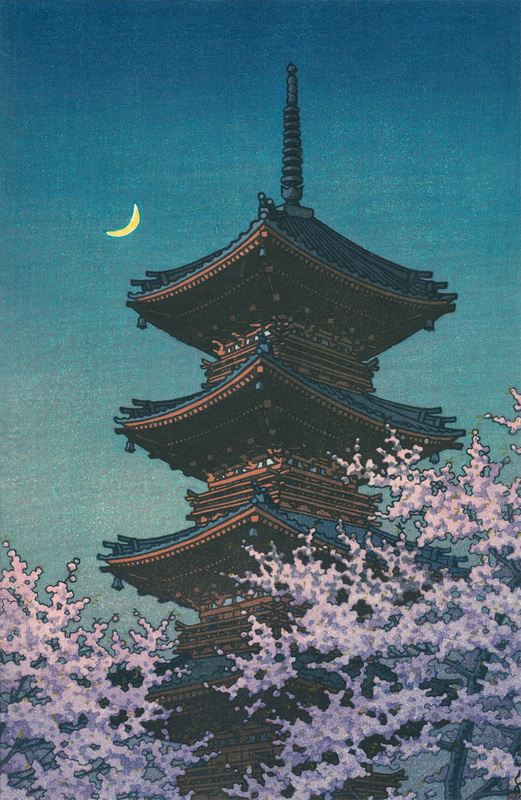 Tsubosaka Temple is famous for "Kannon-Reijyoki" which is Japanese Traditional musical (Jyoruri) made in about 1875. 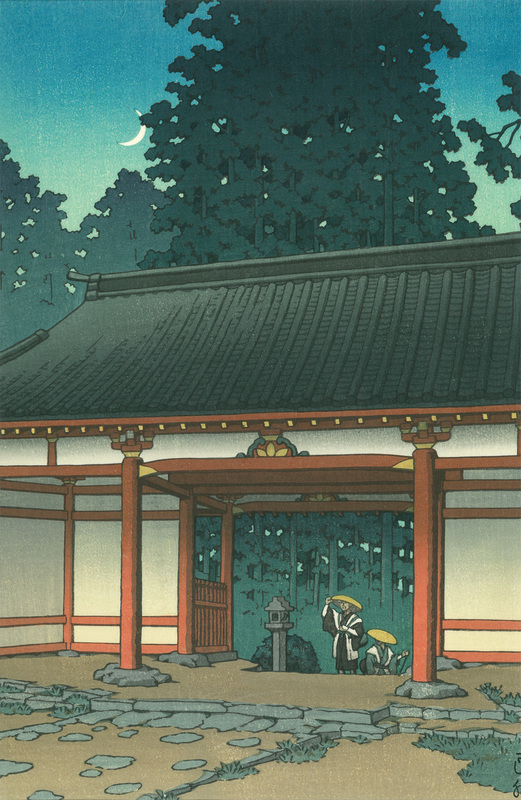 It has a story to save a couple from the death using mysterious Japanese Buddhistic power. 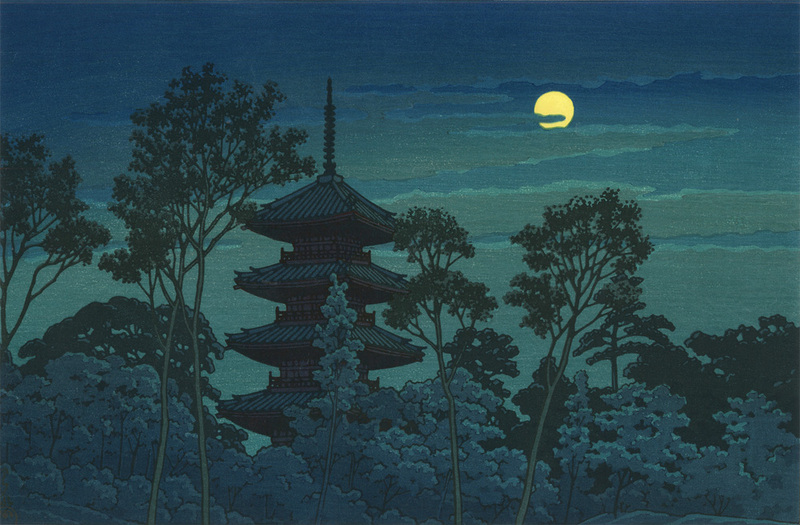 Hasui is representing forest with evening moon from the temple gate where some mysterious Buddhists are visiting. 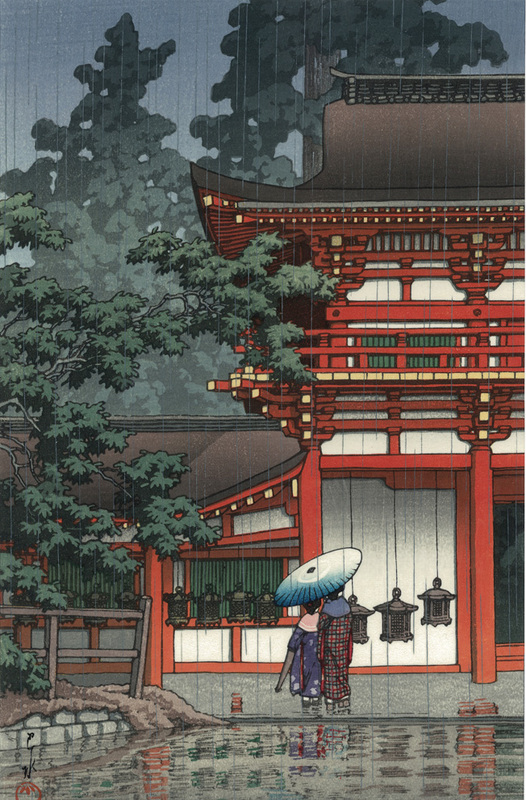 There is Benten pond on the back of the Zojoji temple in Shiba, Tokyo. 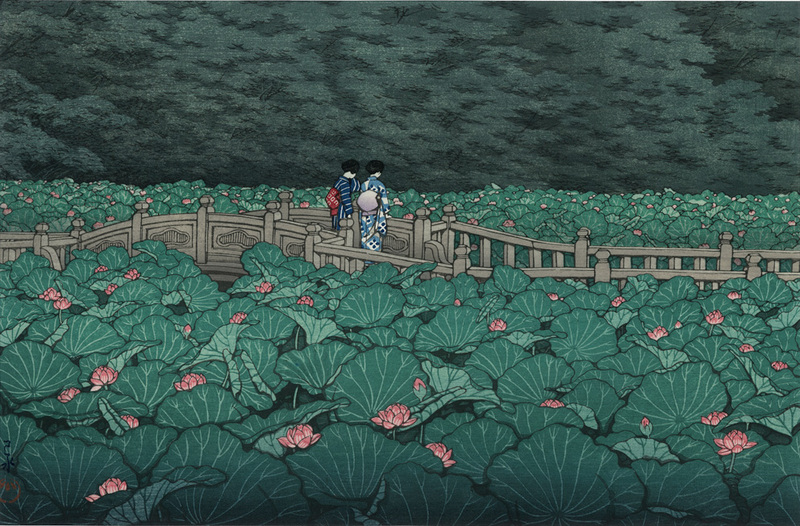 Lotus leaves and flowers are full up all over, and it makes a unique atmosphere which you have never seen in his other works before. 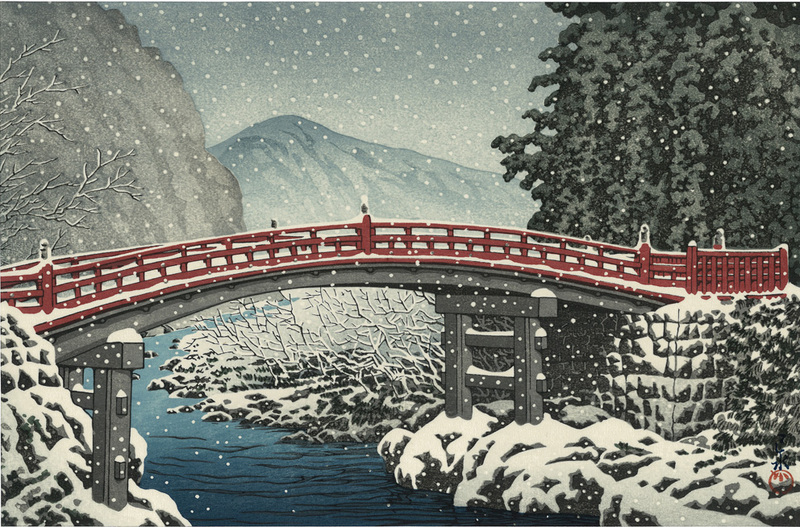 There is Shinkyo Bridge in Nikko, Tochigi prefecture, and it has beautiful red color which decorate the main entrance of Nikko Toshogu Shrine. 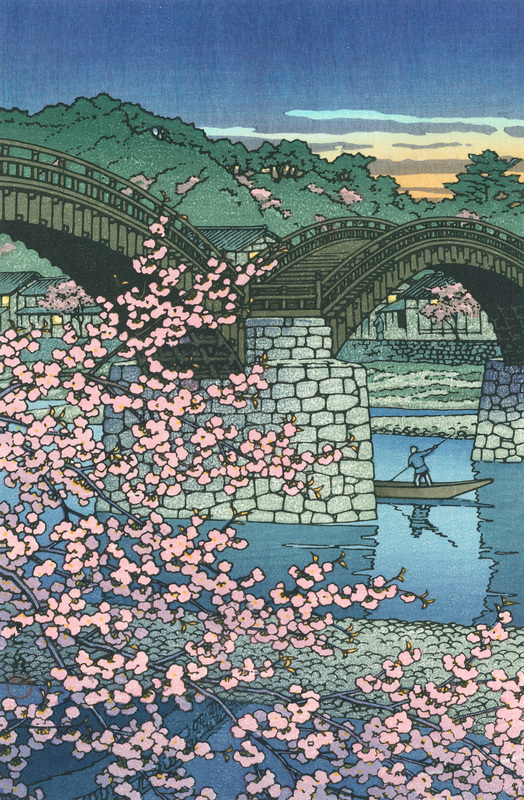 This bridge was registered as a world heritage in December, 1999. 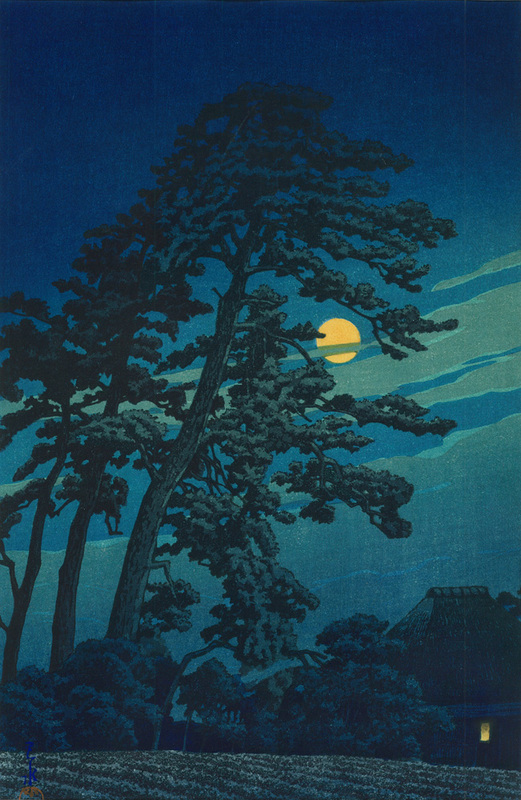 Full Moon at Izura, Ibaraki Pref.